Great Weather! Great Organization! Great Fun! Anita Rastapkevicius from Elgin County was crowned 2016-2017 Ontario Queen of the Furrow last night at Harriston Arena. 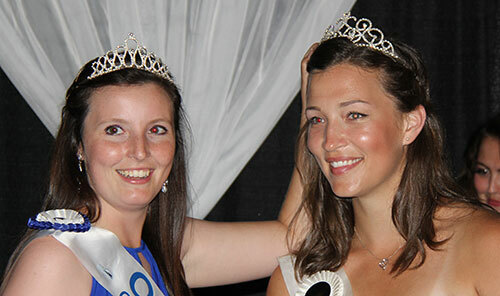 Shown here, she receives her crown from last year's queen, Kathryn Chant of Grenville County (left). Anita will spend the coming year representing the Ontario Plowmen's Association and IPM 2017 being held near Walton, Ontario in Huron County. During the Closing Ceremonies Ron Faulkner, Chair of IPM 2016, passed the OPA flag to Chair of IPM 2017, Jacquie Bishop symbolizing the end of IPM 2016 and the start of the campaign for IPM 2017 to be held next September. Accompanying Jacquie is Huron County Warden Paul Gowing while accompanying Ron is Wellington County Warden George Bridge. Many thanks to Earl and Anne Schneider and family for opening up their farm to host IPM 2016. Follow signs to parking when close. FREE admission for children under 16 from 8:30 am to 10:30 am. FREE BMO Kids’ Day activities in the BMO tent.